Yesterday I released a big update to Finger Tied (get it on the App Store) which enables the sharing of levels in the game. You can now share the levels you create, and download levels created by other players. I think it’s pretty cool, and I hope the players do too. As I was working on the update, I started thinking back on the process of creating the game from start to finish. I like it when other people talk, in detail, about the process of creating their games, so I thought I’d do something to share the process of making Finger Tied. I wished I’d kept a diary or journal about the development of the game, but then I realized that I had the next best thing: my commit logs from my Git repo for the game. Every time I check in code or art, I add comments about what I accomplished. With that in mind, I exported the logs and wrote a little PHP script to generate HTML code of all the commit comments. I’ve also gone back through my screenshots and pulled some that are relevant to given dates. I haven’t edited any of this, so you’ll see references to features that don’t appear in the finished game, because I decided to cut them. The first commit comments are from Guelph Game Jam 3, in April, where I first prototyped the game. It was a game about planting flowers, called Trillium Fillium. From there you can see it involve into something more abstract and into the final game. Adding cc2d files. Adding shell project for GuelphJam3. Multitouch mostly works. There’s some buggy behaviour, but it’s somewhat playable. Original Prototype created for Guelph Game Jam 3 (Apr 15, 2012). New artwork. Removing 2nd touch for now for testing in sim. New artwork, start of json data implementation. Passing level data through to the game scene, but not using it yet. Experimenting with changing the speed of the frame animations on the fly. Tying the animations to the percentage complete. Tying the colour animations to the colours of the touches. Doing a bit of refactoring to set up for tracking touch history. Limiting how much of the screen fills with colour. Committing for posterity: Trying out a moving stripes colour animation. WAY too distracting. Loading all the level data from the json file and using it to build the starting conditions for the level. Tying touch index to the start point index, instead of the order you touched the screen. Fixing a lot of problems with the multi-touch handling logic. Adding a separated level. Fixing some of the math that a split level exposed. Properly handling highlight state updating. Fixing ending the level if you work yourself into a corner. Fixing a bug where all starting fingers needed to happen without any movement. Added spin animation to show history. Splitting the game scene up into play/edit classes in prep for an editor. Getting the main editor UI flow working. Adding start highlight markers so you can see which fingers are active on start. Adding easing equations to the animations for little tweaks. 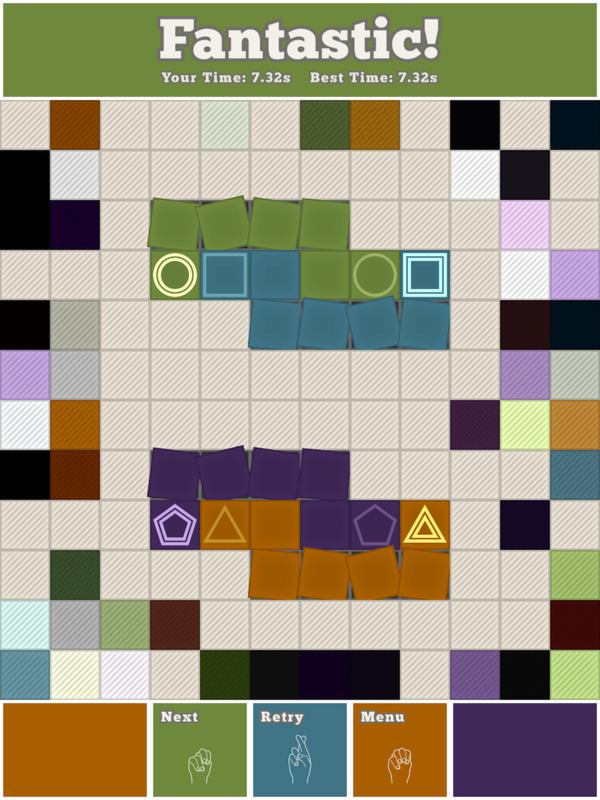 Refactoring some code, and fixing a bug that would allow multiple touches to start in the same tile in editor mode. Improving the editor start touch stuff. Fixing some bugs in the multi-touch stuff in the editor start stuff. You can now draw your areas in editor mode. Handling end tiles in editor. Unhighlighting in editor after done editing. Starting to work on generating level data from the editor. Fixing a bug where you could take your finger off the ipad once you had no more options to move without ending the level. Working on more level data output. Writing the tile histories to the json data. Fixing a bug where you could move your finger around (without lifting it) once you’d backed yourself into a corner with one finger. Now you can’t. Adding some rough sfx for select/cancel. Starting to rough out the UI flow. Changing the history animation so that it only starts once the whole previous anim has finished. Adding some transitions to the FE screens. New buttons in the play menu, and pagination now. Yay! Copying the play menu code into the level editor menu. Adding ability to delete levels created with the editor. Lots of UI mockups and colour changes. UI mockups and font projects. Starting to work on the new front end. NOTE: You CAN NOT launch the game in this build. I removed some art from the texture atlases, so we get crashes going into the sub-menus for now. Playing around with a texture applied to the game in the UI mockups. Solid implementation of the square button. Setting the clear colour to magenta to make it obvious where I’m not drawing. Making the BM font label pay attention to padding values. Adding fonts to project file. Main menu buttons hooked up. New fonts in. Some quick fixes to stop the missing art crashes in the play/editor menus. Switching the FE implementation around so that screens aren’t scenes, they’re nodes. WARNING: This build crashes if you go passed the Main Menu then try to get back to it. Playing with a “stamped ink” effect over the screen. Converting all the remaining screens to the new class format to get rid of the crashes. Also handling the colour changes better. The style of the game is starting to come together. Refactoring FE “scenes” to “screens”. Setting up zOrder on tiles so that they mask the FE contents. Reworking the Main Menu squares to centre anchors so they can be scaled for intro animation nicely. MM outro anim (for now). Also put in temp code for other screens to handle exit properly now that the hack code isn’t in the base class. Play menu. Setting it up for the 4 finger buttons. Just animating them in and out right now. Set up a back button for all screens, managed by the FrontEndScene. Disabling input during screen transitions. Disabling multitouch in the FE. Changing the back button’s highlight colour when the theme is changed. Hooking the play menu up to load the level select screen and pass a variable that tells it which file it should load (not used yet). Changing the squarebutton to use standard touch delegate instead of targetted, so that I can get it to play nice with the scroll node. Starting the scroll node implementation. More work on the scroll node. Cancelling input to children of a scroll node once movement starts. Fixing the case where the innersize was smaller than the viewsize. It was causing weird bounce behaviour. Fixing gaps between scroll view elements by setting “Extrude” to 1 in TexturePacker. Setting 2D projection. Working on the level select screen. Hooking the level select buttons up to the game to launch the appropriate level. Fixing a crash that resulted. Adding more things to the level select buttons. New editor UI screens implemented. Main FE flows now working. Lots of new colour schemes, mockups, things tried, fonts. Progress with visual style! Tweaking position of screen titles for new font. Main Menu design is largely what shipped, though obviously with different colours. ASL fonts and new UI designs. Swapping finger icons on Play Menu for new ASL font. 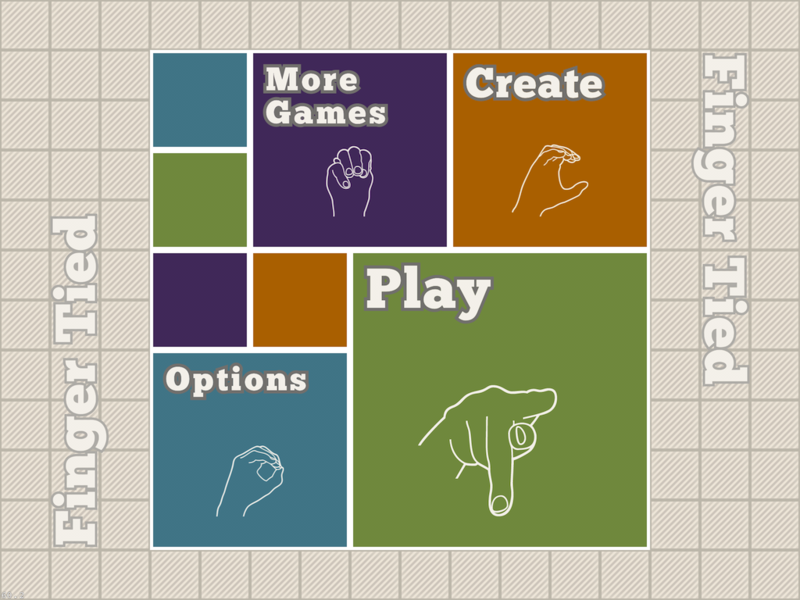 New ASL font and layout in Level Select screen. Applying text colour to a few labels in the level select screen that were missing it. Adding a whole bunch of new colour themes. New colour palette is in the game. Splitting levels into their respective json files based on num fingers used. Adding a bunch of new levels. Create now launches straight into the level editor. Adding a “My Levels” button to the Play Menu. New animations for the Play Menu. Quitting to appropriate FE screen from inside the game now. saving some level editor json files. Fixing bug in level select where extra row of space would show up in scroll view when even number of levels present. Bug fix: resetting tiles to the background colour (instead of white) when stopping the colour anim. Also tweaking the math that calculates how much of the screen to use for the anim to take into account the new buffer around the play area. bug fix: flicker on startup. failure animation (breaking glass) added. 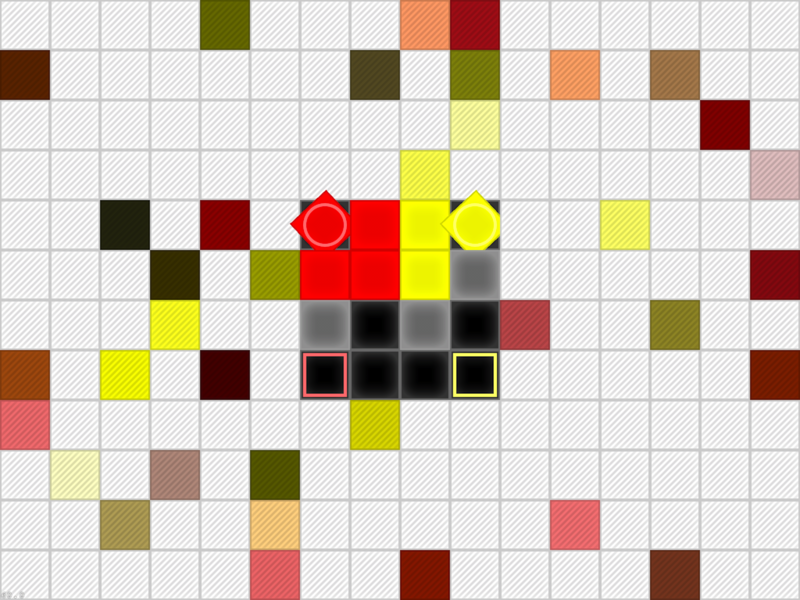 added a buffer to touches so the game feels a bit more forgiving. Failure anim only plays on tiles playing colour anims. Switching the start/end icons. Playing with the colour/lines animations to make them come in sooner, appear right away as the user completes the level. This makes the tiles dropping off feel a lot cooler. Save implemented for percent complete progress on both built-in levels and created levels. Also painting the preview using the background colour. Hooking up the Testflight SDK and adding some checkpoints. Adding in scroll-to animation functionality to the scrollnode class. Limiting the level creation area to a 12×12 centred grid. This gives room for UI elements that are guaranteed not to overlap gameplay area. Creating new button class. Replacing the back btns with the new btn class to make sure it works. Converting the custom buttons to use selectors instead of delegates. Changing all relevant code. Added a temp “back” button to the game that returns you to the FE immediately. This will become the pause button. Removing several unneeded source files. Starting work on the pause screen class. Cleaning up a bunch of compile errors. Removing the stars hand and percentage complete when user hasn’t completed the level. New pause button art. 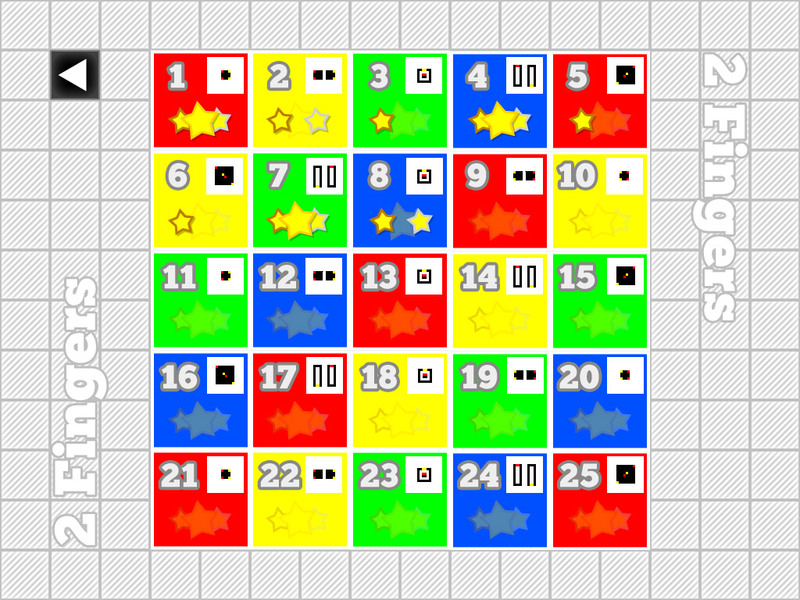 New art and positioning code for the stars on the level select screen. Functional pause menu. Needs some new fonts. Needs intro/outro animations. Pause menu for main game play complete? WIP: Batching tile draw calls. NOTE: FE is currently broken as the background tiles render in front of the FE buttons. Changing the tile default bg to be the on-square with a colour tint as a lighter version of the bg colour. This looks really nice when the tiles fall away on failure. Fixing the FE drawing by splitting the tiles in the bg out into a separate batch node. Adding classes for the other soon-to-be in-game menus. Hooked the existing pause menu up in the editor scene. 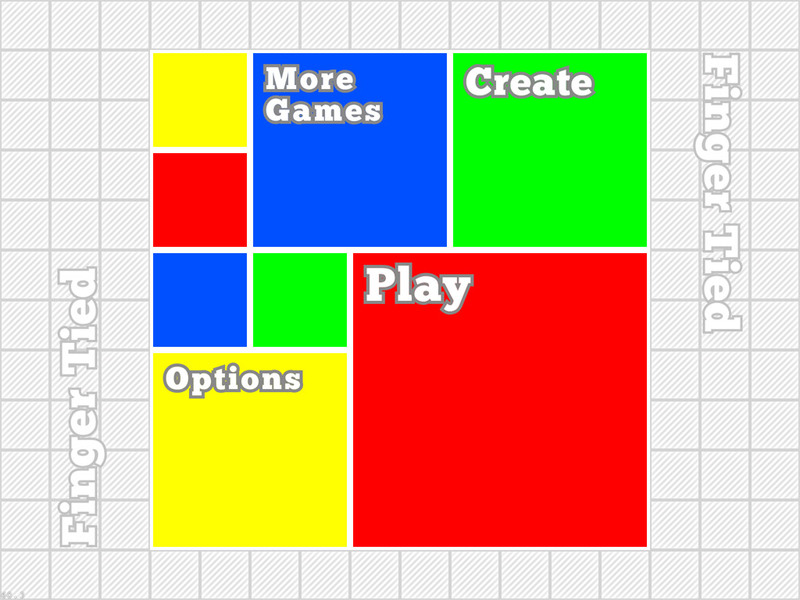 Building new post-level-play menus. Buttons all quit for now. Fixing a couple of compiler warnings causes by method name changes. Implementation for the post-edit menu. Adding a new, really hard, 3-finger level. Most of the failure cases are displaying the fail point (except back-tracking). Build Target renamed to “FingerTied”. Game display name now “Finger Tied”. Handling showing the failure marker for backing up over a tile already added to the path. Adding an animation to the failure point sprite. Tinting the fail point to be in the same colour family as the touch that caused the failure. Doing conversion to HSL so I can adjust the brightness. Saving a few new created levels. Reskinned the editor “how many fingers” menu. Starting working on the tutorial. Lots of work on tutorial system. You can launch it now and run through the tutorials. A bunch of bugs to do with retry levels, or actually finishing the tutorial, though. Fixing some colours in the tutorial post screen. Checking in progress on the tutorial, but I’m about to rip it out. Tweaking start tile pulse anim time. Adding a pulse to the end points once all start points are activated. Displaying a reason message for failure and reworking the success message for when I have timing working. Implementing the “next” button on post-game screens. Removing “next” from the play fail screen. Timing levels and displaying the time in the success screen. Times are not saved yet. Tutorial levels json file. New screenshot. Saving and retrieving per-level best scores. Changing time format strings. Displaying total time for a level pack if the whole pack of levels is completed. Fixing some labels that weren’t using the same naming convetion as other places. Adding the tutorial levels to the start of the various level packs. Saving the scores for the user created levels properly by adding a -1 score when the level is created to the NSUserDefaults. Bug fix: levels with start/end point on the same tile would show the failure marker even though level had been properly completed. Hiding pause button when pause/postgame menus are up. Adding a whole bunch of created levels to the appropriate level packs. These are NOT in any particular order yet. Fixing missing comma in one of the level files. Post Game screen. It’s becoming clear that lanscape orientation is becoming problematic. Bug fix: changing colour theme would reset all the tiles in the FE so the black background would disappear. Fixing font spacing for non-retina chunk 18pt. Adding temp app icon so testers have something to see at least. Better testflight beta tracking points. Anonymizing TF tracking data. Reordered all level packs based on some difficulty testing play-throughs. Various project/code changes readying the first tester build. 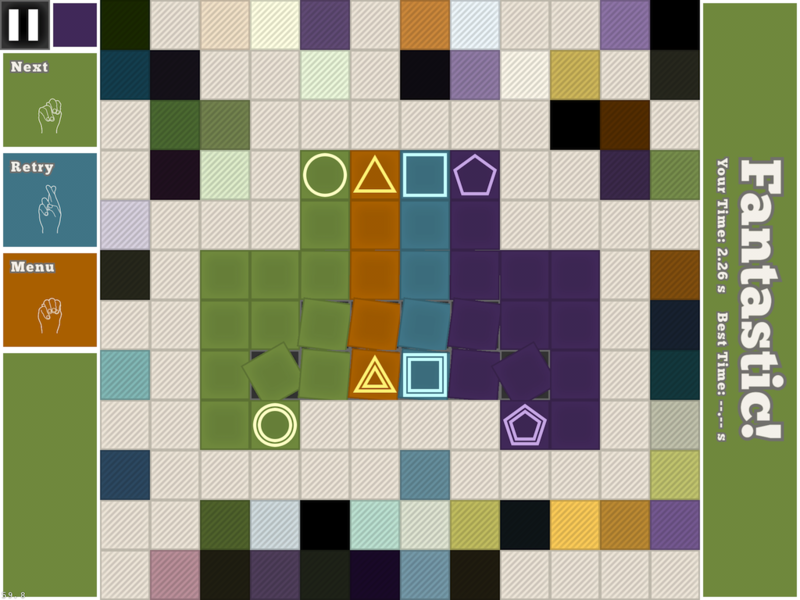 Making the available tiles highlight significantly more subtle, as it was confusing some testers. Trying a new version of the play menu that shows two hands instead of single hands for multi-finger level packs. Multitasking Gesture warning is implemented. It gets stored that a gesture was made and displays a message next time a 4-finger level is launched. Adding random tips to the menus. Increasing the fudge factor by a few pixels to make it a bit easier to larger fingered players. Wasn’t comfortable with how much I increased the fudge factor. Slight decrease. Applying a fade to the non-active start/end pieces. So end pieces start faded, then start pieces fade out once all active. Removing testflight SDK, adding Flurry for beta testing analytics. Post-level screenshots for doing mockups. Portrait step 2: post-level screen and pause button. Portrait step 3: level editor. Game has been reworked to render in portrait orientation, making everything better. Adding first pass at music loop to the game. Disabling the history animation during gameplay and playing it as soon as the user finishes a level instead. Several testers mentioned the animation was confusing/distracting during gameplay. This feels much nicer. Applying the stripe animation to all FE tiles. Adding some interactivity on the menus. Touching the background tiles plays a one-time colour tint animation. 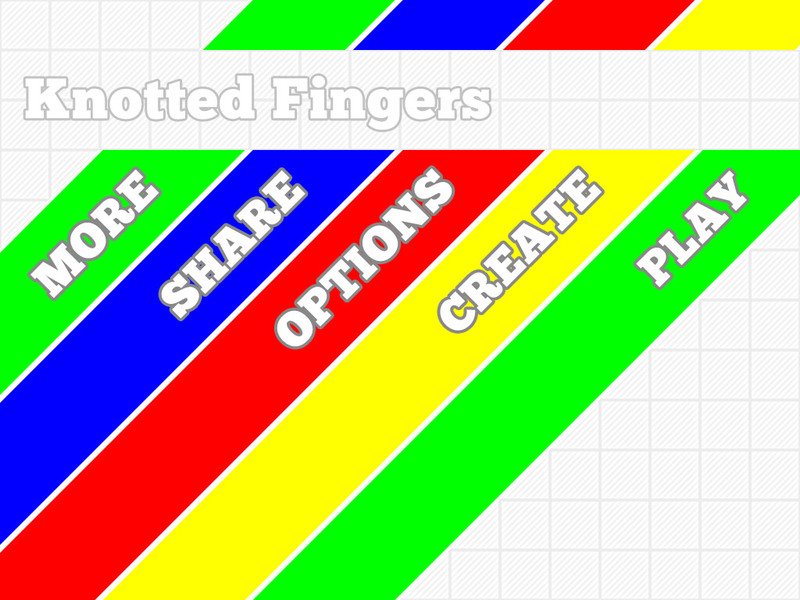 Attempt at new finger icons for the play menu, but I don’t like them. Checking them in, but will be removing them. Reverting to the ASL letters on the Play Menu screen. Fixing an animation in the Main Menu. One of the squares was sliding in slightly faster than an adjacent square. You can set mandatory and directional tiles and they render properly. There’s no UI and the values aren’t stored yet, but you can draw them. New music loop from the composer. No sax. Bunch of artwork that needed adding. Created new flurry api key. Special tiles can be saved and loaded from json data. Making the square button class toggle-able. Adding top menu for the post edit screen that has buttons for directionality and mandatory tiles. Buttons do nothing yet. Exposing whether the square button is on/not on as a property. Allowing other code to set the state of a square button. Post edit UI hooked up and functional. Allows full creation of levels with special tiles. Gameplay now has rules for special tiles. However, failure reasons not implemented yet. Adding all the logic to detect new failure reasons: diagonals, directionals, mandatory colours, slipped end points, and a catch-all. Adding help text to the failure screen for the new cases. Removing the upside down screen title text (doesn’t work in portrait) and moving the tip text up into its place. Shortening the tip text (and adding some new tips) so that they fit into the new space next to the back button. Tweaking the sizes of the mandatory square markers. MUCH nicer now that they all feel the same size. Removing unused iPhone icon sizes. Adding some temp code to kill any level progress save data for this version because the level ordering will change. Fixing button order dismiss for fail screen. Not sure what’s changed in this PSD, but checking it in. 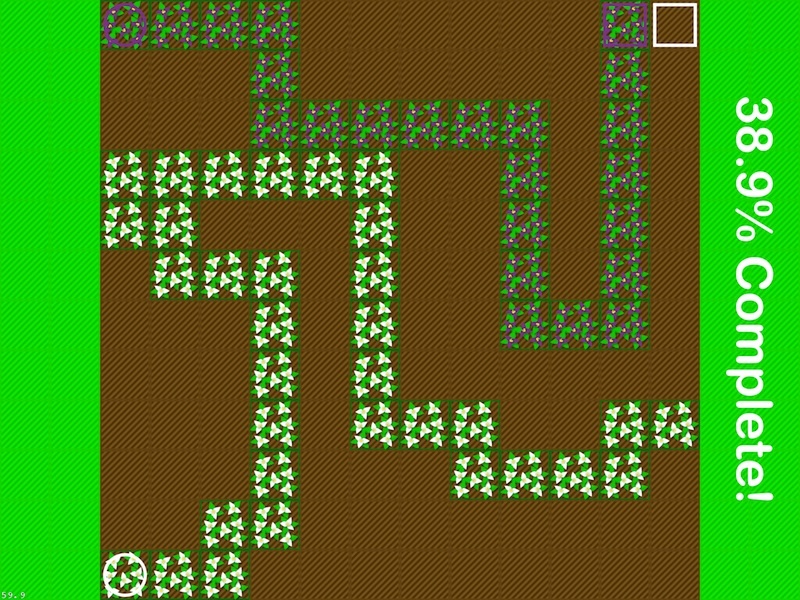 Adding new levels with special tiles to the level sets. I had broken the FE when switching colour themes during the switch to portrait. Fixing. v0.2 build sent to Testflight. Latest music loop. GameCenter implementation (no icon in main menu yet). Game Center leaderboard icon art. Custom game center icon added to the main menu. Disabling the GC icon on the MM when the player isn’t authenticated. Also, setting up a notification to the MM to let it know when the state has changed, so that it can enable/disable based on the async event. Adding the “More Games” popup. Replaced the AAC music loop with an AAC-compressed CAF file. This eliminates the stutter when looping. Hooking up a few of the options menu items. Adding icons for the music/sfx controls in the options menu. Properly updating them based on state. Initializing music/sfx on launch based on saved states. Uncompressed WAVs for the various versions of the music loops. Credits screen implementation. Needs final credits list. Adding particle effect on level completion. Needs tweaking, but looks pretty good so far. Finished tweaking the level complete particle system. Improving the “fail” icon animation. Is much more obvious now, which should help people recognize a fail state has occurred when playing. First pass at a “select” found effect. Still a bit too loud, but a good start. Tweaked volume on the select sfx. Added new “back” sfx. Changed the button class to expose the sound it plays on trigger. First attempt as lose SFX. Fixing bug where returning to game from multitasking to a FE screen outside the MM caused a crash because it wasn’t cleaning up its NSNotificationCenter registration. Bug fix: leaving a directional from the wrong edge generated an “incomplete” fail state instead of a “directional” fail state. Bug fix: if finger 1 is stationary and finger 2 boxes finger 1 in, the game didn’t end. First pass at COMPLETE LEVEL REORGANISATION. UI still needs work, and level progression needs extensive play testing. Adding additional “trumpet” particle systems to the sides of the screen. Had to convert blend mode back to additive after discovering I was using an invalid blend fun parameter in previous blend. Only playing the new side-of-screen fanfare particles if you set a new record on a level. Otherwise you just get the end points bursts. Bug fix: Game would slow down significantly the longer you played it. Discovered the post-puzzle screens weren’t being cleaned up, so were still be rendered and reallocated every time you finished a puzzle. Eventually caused massive slow down. Now being cleaned up properly. Improved the handling of mandatory and directional tiles. These could produce “blocked” fail messages, which were confusing. Now lets the user move incorrectly onto them first so that they get a more useful fail message. Starting to reorg the layout of the level select buttons. Finished new layout for the level select screen. Two-pixel tweak the positioning of text on the level select screen. Final layout of the Level Select menus. New stars art. Positioning stars. NOTE: this build displays random stars for every level, just for positioning testing. Only displaying stars in the level select screen if you’ve completed a level, and displaying the correct star based on the par times. Displaying target times on post-level success screen. Adding animated star awarded for your current time. Fixing case where 3rd significant digit would prevent you from winning a star. Par times for easy levels. Only showing the goal stars above what you just earned. So you just got silver, it only shows you the gold target time. Adding the star target times to the play fail screen. Making the centre of the screen tappable to restart on fail. Has a 0.5s delay before activating to try to prevent mistaken triggering at the end of a level. Allowing user music to play instead of game’s music. Par times for Medium and Hard. Rearranged a couple of levels. Bug fix: double play music on startup. Returning the play menu screen to use single-handed icons for different difficulty packs. Adding trash can buttons to the level select screen when viewing your created levels (but they don’t actually delete yet). Converting the SquareButton to use either standard or targeted touch. Adding new input blocker class. Adding popup for delete confirmation to the level select screen. Delete still not actually being done. Actually deleting levels and their associated save data! Touching up the font bitmaps: fixing holes and funny spikes. Locking level sets until prev set has 10 levels completed. Added lock icons and lock explanation text that fades in when a locked button is pressed. Reworded the “incomplete” text to show how many levels have been completed. Adding a compile-time cheat to allow me to unlock all the level packs. Displaying stars for each level pack on the Play menu. Displays the star for the lowest star level you’ve got across all the levels in the pack. LOTS of work on the icon. Lots of new icon art, including final icon designs! Copying final icons into the project. Adding first pass at SFX files. Adding in hookups for the FE sounds. In-game sound hookups for first pass SFX. Applying a tiny random pitch to the soundOn SFX so that they give a bunch of really subtle variation in the sound. Adding promo popup code in case I ever need it. Bug fix: side particle effects systems were not cleaning up on restart. Resulted in big slow downs on iPad 1 after playing many levels. Adding SFX hooks to the editor for edit start and end. Some new raw level files. Final raw SFX from audio guy. Increasing default capacity of sprite batch nodes since they were overfilled every time, which caused a realloc. Adding in final levels and doing some removal and rearranging for difficulty tuning. No par times for new levels yet. Tweaking the character padding on the 18pt font for non-retina iPads, as it was rendering too wide in the UI. Fixing some buggy behaviour in the scroll node. Touching it wasn’t stopping an scroll in progress. And performance dips on 1st gen iPad would cause really messed up behaviour because of where the dt was being used. Evolution of the icon design. Made the silver/gold targets for beginner levels easier to achieve. Fixing float rounding display bug on the play success screen and level select menu. Tuning target times for all easy levels. Tuned the Medium difficulty target times. Replaced accidental dupe level. Tuned target times on Hard up to level 28. Finishing the tuning of the hard level target times. Tweaking the ‘tap to retry’ time on the fail screen. Needed to be slightly shorter delay. Bug fix: Disabling input to the game when the pause menu is up. Also disabling the pause button while fingers are playing a puzzle. Upping project to v1.0 in preparation for submission. Upping reset value to 1.0 so it resets beta testers’ builds because all levels were reordered. More levels exported from ipad. Release Candidate ad hoc IPA. Thanks sections added to Credits screen. Adding help message for players to the My Levels screen if they haven’t created any levels yet. Removing a bunch of unnecessary flurry events. Repositioning the multitouch gesture popup for portrait layout. Pointing the twitter button to the new @FingerTiedGame account. First draft of app store description. Displaying Multitasking Gestures popup *as soon* as a gesture is detected, instead of on next launch. Should help with people getting confused. Sound files show as modified, but not sure why. They appear to be correct, so maybe I forgot to check them in? Lots of finger tied ads and screenshots. A whole whack of screenshots. Latest changes to the FT app description. Added Parse framework and started working on level sharing. Realized how huge this is going to be. Going to set this aside for now and come back to it later. Created an iPhone target. Builds and deploys, ready to start work on iPhone version. Main menu converted. Loading iPhone textures. I think I found a good size for the tiles, but it’s hard to tell yet. 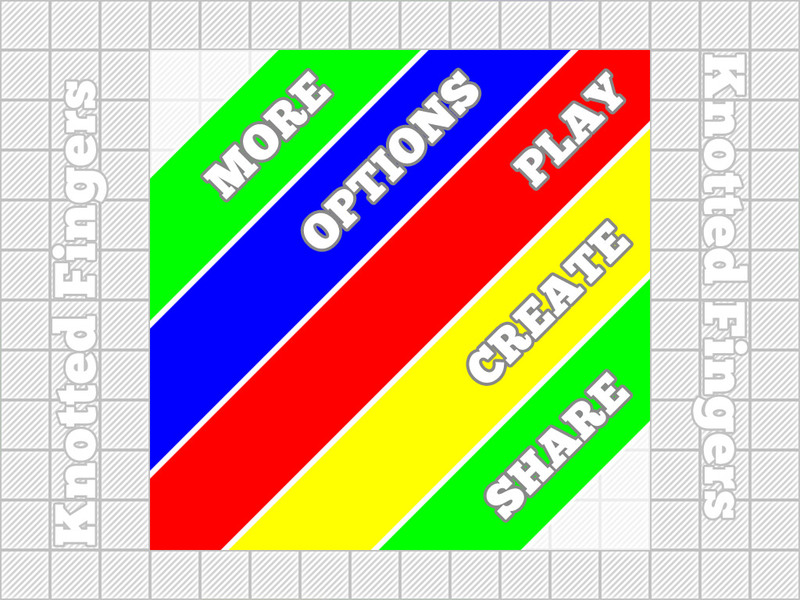 Rough pass at Play menu for iphone. Functional, but not pretty. Working on the editor post edit screen for iPhone. Editor post screen layout works, but still needs tweaking. Better layout on the editor post screen. Play fail screen for iPhone. TexturePacker 3.0 file for the game atlas. Splitting tips into iPad/iPhone. Customizing iPhone tips. Reducing tip display time from 10 to 7s. Some first iPhone level designs. Adding button for 4 fingers in the editor for iPhone. Temporarily putting all created levels into Beginner so I can send an iPhone build to testers. Fixing the More Game popup for iPhone. Changes to prep a test build for iPhone. Some debug code that forces the iPad build to run at iPad Mini size. Committing inactive. Fixing a few UI glitches introduced to iPad code during iPhone porting. Adding “more levels” button to the main menu. Stubbed out the more level screen. Working on level sharing stuff. Built a popup widget I can use for general popup messages now. Converted the level select screen to use the new popup. Adding Parse code back in. GC sign in popup when trying to share a level if not signed in. A whole whack of Finger Tied related files. Not sure why some are marked as modified, but checking ’em in. Uploading levels and tying them to a player object works. Tracks which levels have been uploaded. Does not handle the errors well yet. Starting to work on loading “more levels” data from parse server. More Levels screen properly loading/closing without generating extra buttons. Added buttons for filtering results with stubbed out calls. Implemented 3 of the 4 queries we want for filtering. Search needs more UI. No caching yet. Displaying search UI in more levels. Non-functional yet. Textfield needs property tweaking too. Properly positioned/sized search field. Not doing proper attributes yet. Proper text field attribute settings. Two search fields now. Search works. Caching the queries. Handling network failures nicely. Canceling queries when moving between filters. Adding a constant upward counter for created levels. Renaming levels player has already created to conform to the new system on first boot after update. Adding proper level naming to editor code. Killing active queries when leaving the more levels screen. Built the popup menu for settings on the My Level screen. Upload/delete now done via this popup. Bringing up a popup when a level is selected in the More Levels screen. Buttons just call callbacks, but don’t do anything yet. Fixing a bug where the game became unresponsive if you closed the keyboard from the search page and attempted to back out of the screen. Also added some text to the screen in cases where no results are returned from the server. Likes and Reports working. Game auto-ignores any levels with 3 or more reports. Implementing the download button in the More Levels screen. Though you can’t actually view the levels anywhere. Adding a downloads screen, and a button to the play menu. Seems to be a crash trying to save best time on downloaded level. May be bad data in the NSUserDefaults? 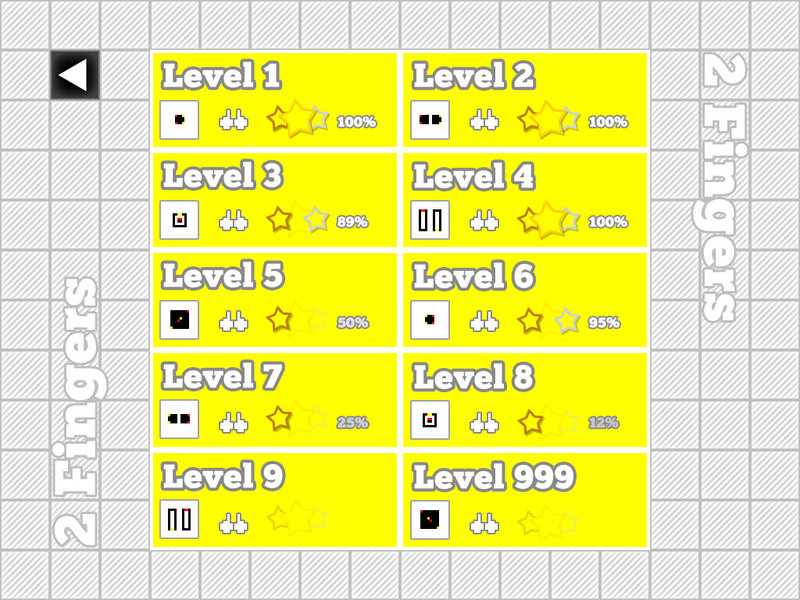 Need to update the level buttons in More Levels screen to use the new font/level name stuff from Downloads screen. Fixing the crash after completing a downloaded level. Handling deleting best times on downloaded levels properly. 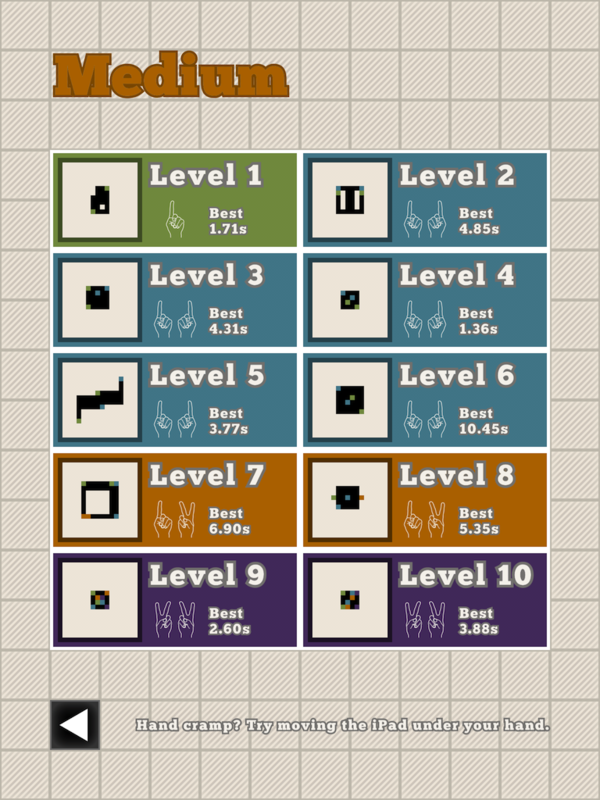 Displaying proper levels names for More Levels screen. Displaying # likes on More Levels. Fixing some bugs with incorrect Setttings displays. Implementing pagination of search results. Displaying a “loading” animation when a query is running. Displaying game center message to user when going to “my levels” sub-screen. Shrinking button text on the FEPopup slightly to accomodate slightly longer text. Displaying network errors as popups in More Levels. Fixing a bug where some queries weren’t being cancelled. Fixing a bug in the More Levels where rapid tapping would result in a duplicate copy of the level data. Fixing a bug where tapping the Refresh button when search boxes were showing caused a crash. Implementing deletion of shared levels. Fixing a bunch of potential crashes. Better network error handling and display. Not displaying Like/Report buttons if already liked/reported. Displaying proper level names in popups. Created new art for more levels filter buttons (but they’re not in-game yet). Removing some unused art from the atlas. Added icons to the filter buttons for More Levels screen. Delete/settings popups on My Levels were showing incorrect level name. Adding delete confirmation when deleting uploaded levels. Making popup msg scale to fit text that’s too long. Fixing some calls to open vertical popups that were displaying level name incorrectly. Adding instructional popups on upload/download telling the player where to find the levels. Ordering the user level’s query by creation time so they see their most recent uploads first. Adding a “new” icon to the More Levels button on the main menu that disappears once clicked. Improving the promo system so I can show popups with users with specific builds. Will be used so I can show players who haven’t updated a popup announcing the update. Upping the build version to 1.1. Parse requires iOS 5.0 or higher, so upping the min supported version to 5.0 from 4.3. Adding version (read from info.plist) to the credits. Pointing the twitter button to my own account instead of the FingerTiedGame account. WIP: Level sharing and custom URLs. Handling custom URLs to load into the search page properly. Doing proper copying to pasteboard for iOS5 (previous version wouldn’t copy both text and images). Removing the level id search box. Making the level sharing shorten the fingertied level link with tinyurl. Made it async so it doesn’t hang things. 1.1 build and what’s new notes. On Friday I jokingly posted on twitter that I was going to write my #iDevBlogADay post on “How to code with a baby in your arms”. A whole bunch of people responded saying they’d love to see a post on “The Distracted Programmer”, so here I sit typing. With a baby born over five weeks ago, I took several weeks off work entirely. But about two weeks ago I started trying to get back into doing little bits of work. Working from home with a baby in the house is proving to be quite difficult, but I’ve already learned a few things that are helping me get at least some work done. Just keep in mind, I’m still new to this. I don’t pretend to have all the answers, just some tips that work for me. When I first decided to start coding again, I set a goal of writing one hour of code per day. The first few days I failed miserably. I’m glad I hadn’t decided to work full days or I might have been very discouraged. However, after a few days I found I was able to get even up to two hours of work done, just in 20 minute increments. My main point here is don’t expect too much from yourself at first. Getting used to having a baby is a huge change, trying to work at the same time is a massive challenge. Accept that it’s going to be hard and don’t beat yourself up if you’re not working full days right away. If you haven’t read this excellent article called “The Interruptable Programmer“, do so now. All of his tips apply to working at home with a baby in the house. I’ll wait. Done? Good. The biggest take-away there is that you need to get used to working in small chunks. Always be aware of what you’re working on. Make notes about what needs to happen next. If you need to stop coding because the baby starts screaming, jot down something quick about what you were doing; put it right in the code if you have to. Personally, I bought a little Mac app called ShoveBox that allows you to take very quick notes just by pressing a key combination on your keyboard. If you’re a programmer who likes to really dig deep into code and do marathon coding sessions (like I used to), this is going to be a huge adjustment, but it’s a necessary one. If the choice is between coding 30 minutes at a time and not coding at all, I’m going to try to code 30 minutes at a time. One of the most difficult things for me over the last couple of weeks has been staying motivated when I can only code in short bursts. It’s easy to get side tracked. It’s really easy to get distracted with reading blogs posts [cough] after each break in coding. This will kill your time. You need to find ways to keep motivated and keep working. I’ve completely stopped reading RSS feeds during the last two weeks. It means I’m not as aware of what’s going on in the world of gaming, but I’ve got a contract to deliver on, so that takes priority. I try to limit my time on twitter when I’m starting a work chunk. I limit what links I click on to avoid being distracted. The goal is to get right back in where you left off after you’ve been away from the computer for a chunk of time. This will help you stay motivated. Avoid the distractions, and you’ll find a new flow. This is the most important point. Seriously. Make sure you do this. If you’re a single parent, you’re amazing. I honestly don’t know how people do it on their own. A baby is a huge amount of work, even spread over two people. Single parents, I’m in awe of you. But, if you’ve got a partner who is also at home (on maternity or paternity leave, or as a stay-at-home mom or dad), talk to them. Make sure they’re on board with you going back to work. You will need their support. You will need them to look after the baby while you’re at work. You will need them to understand that you’re going to need some time to code/design/draw/create. At the same time, make sure they understand that you’re not disappearing. If the baby won’t stop screaming and they need a break, let them know it’s OK to interrupt you and ask you for help. But also make sure they’re OK with you shouldering them with more responsibility while you’re working. As the baby gets older, and you establish more of a routine, hopefully you’ll be able to spend more time working each day. Having an amazing wife who understands all of this has made it much easier to get back to working. I’m still only working half-days, but without her support I wouldn’t be doing even that. There are times when I need to look after the baby and do work. If (and this is a big if) the baby is in the right mood, sometimes he’ll let me put him into a baby carrier and he’ll happily sleep while I sit and do some coding. It doesn’t always work, and it’s not ideal, but it is a way to look after the baby and do some work at the same time. Yes, I’m talking about working with a baby in the home, but the final thing I wanted to say is to remember that your baby and your family come first. If your partner needs you, be there for them. If the baby needs you, look after him/her. Yes, we need to get work done, but work isn’t everything. Working at home with a baby in the house is possible, but it is very challenging. The thing I keep reminding myself is that it’s an amazing opportunity most people don’t get. Most people don’t get to go back to work yet still see their child grow up before their eyes. We’re very lucky that we get to do this. Don’t take it for granted. Enjoy it. What about you? As a mom or dad programmer/designer/artist/creator, what are your tips for working from home? A couple of months after I launch a game, I like to sit down and take a hard and honest look at the things that went right and the things that went wrong: a postmortem. It’s a great exercise to go through after a game is launched to learn from your successes and, more importantly, your mistakes. I wrote up a postmortem after launching Monkeys in Space that was based on the structure that Game Developer Magazine uses. I’m going to use that same format for this LandFormer postmortem. If you haven’t played the game, LandFormer is a puzzle game for iPhone/iPod touch. Each level is made up of a 5×5 grid of terrain at different heights (oceans, up to mountains). The goal on each level is to use land forming tools to modify the heights of the terrain tiles to flatten things out. It’s a challenging game that starts off very easy, but get quite difficult in the harder levels. It’s a game that requires skill, patience, but most of all, intuition. The game is free to download and try (there are 12 levels currently in the free version of the game), with In-App Purchase (IAP) available to upgrade to the “full” version of the game, as well as IAP for additional visual themes and additional levels. I think of it like a demo, where the user gets to try it and then decide if they want to spend money on more levels. The free version also contains ads, which are disabled if the player buys any content from the in-game shop. The game launched on June 29, 2010 and has had 147,000 downloads of the free version of the game so far. I’m really happy with how the game itself turned out. LandFormer started as a prototype called “UpDown” that I did in 6 hours at the all-night GameJam for 360iDev Denver in September, 2009 (I participated via Skype). After I launched Monkeys in Space, I returned to the prototype in early 2010 and started playing around with ways to make it more fun, and settled on the terraforming theme, which helps players understand what they’re supposed to do, and why. What I like most about the game is that I haven’t really seen other puzzle games like it. It’s similar in play-style to sliding block puzzle games (it requires a similar combination of spatial reasoning and intuition), but the up/down movement of the pieces makes it feel very new and requires new ways of thinking. It’s also very easy to learn how to play, but takes time to really master it and get good at the more difficult puzzles. In the end, I think the gameplay stands as being strong, and I’m very pleased with how the game turned out. This is my 3rd game, and thus my 3rd game launch. However, with LandFormer I decided it was time to try a new launch strategy. With my previous games, I launched the games as soon as Apple approved them. This caused all sorts of problems in terms of getting press materials out, and reviews trickling out gradually. With LandFormer, I decided to set a proper release date. When Apple approved the game, I set the release date for a week and a half into the future. I immediately sent out press releases to sites along with promo codes (yes, they work once the game has been approved, but before it’s available in the store) for press to try the game. Because my content is all IAP on my server, I could also make it available to the press for free during the pre-launch review period. Very handy. The result of this new launch strategy was that several large review sites had reviews out within one or two days of launch. This helped pick up momentum for the game, then the first Thursday after launch Apple featured it as a Hot New Game. The Friday immediately after the feature, Gizmodo ran a review of the game, which boosted downloads tremendously for the following weekend. I really couldn’t have asked for much better a launch. The only way it could have been better was by getting a front-page feature, or App of the Week feature from Apple. They’re probably just saving that for my next game (har har). As all developers do, I struggled a lot with the pricing model for the game. My other games are both paid games, but Dapple has a separate Lite version for players to “try before they buy”. The thing I don’t like about the Lite model is that it requires players to download two separate apps if they then want to buy the game. It always felt kludgy to me. Ultimately I decided to set things up like a PC or XBLA demo: free to download it, but if you like it, buy the full upgrade from within the game. This is the really exciting monetization path that IAP opened up when Apple introduced it. Because I was implementing the in-game store for this anyway, it also allowed me to developing a theming system for the game and sell themes. It also means I can continue to release new level packs for users without having to update the game itself. I think the model has a lot of potential on the app store. The free download gets you maximum visibility on the store (people are willing to download something just because it’s free), but then you have a way to earn some money within the app. However, it’s not all rainbows and unicorns: see the corresponding section in What Went Wrong. When I started building the game, I was building levels as string of data then loading them into the game and testing them. This was ridiculous. I realized early on that building a level could be seen as solving a level in reverse. I was able to very quickly build a first pass at a level editor just by reversing the rules: start with a flat plane, and use the tools to deform it. This had two advantages: 1) it made building levels much easier, and 2) it meant that any level created in the level editor was guaranteed to have a solution. Once I had it working for my own purposes I decided that it needed to be available to players in the game. The level editor is so easy and intuitive to use, I need people to be able to play with it. I’m happy I took the time to do the UI work required to build the level editor out into something that everyone could use. The editor allows players to create their own levels, but beyond that, I implemented a sharing system based on URLs, where players could email a level to a friend. The friend clicks a link in the email and the level opens inside their copy of the game for them to play. It’s a simple system, that I think works quite nicely. Since Monkeys in Space, I’ve been doing everything except the music in my games by myself. For both Monkeys and LandFormer I did all of the game design, programmer, artwork, UI design, sound design, PR, and marketing. I don’t do music, because that’s just something I’m not capable of doing myself. However, doing everything myself has given me a lot of freedom to make the game exactly how I want to make it. It also allows me to think about how a change will impact all the various aspects of the game. And, perhaps most importantly, it allows me to save a huge amount of out-of-pocket expense. I would love to have the funds to pay a full-time artist to work on the game, but that’s just not in the cards for me yet. I do have some art background, but doing all my own art for these games has helped me get a lot better than I was. I hope I’ll continue to improve. However, this is also another one of those things that also appears on the What Went Wrong section. So let’s get to that now. I listed the reasons why I thought Free + IAP was great for LandFormer, but it’s also something that didn’t work great. One thing I was not at all prepared for was a backlash from users over the pricing model. I thought that players would be happy that they were given an opportunity to try the game before spending any money on it. However, the reaction from a lot of players instead was “The game says it’s free, but you have to buy stuff!” I got called a cheat, a liar, and a con artist. My immediate reaction was that my app description clearly states that you only get the Beginner levels for free and have to buy the others. The app page in the store also lists the top IAP. But what I learned is that no one reads that stuff. I think I got a lot of downloads (especially after some of the big press stories ran) from people who saw the name, the icon, and “free” and downloaded it. The problem is that there’s a disconnect between my view of the pricing model, and that of the minority of angry, vocal, app store consumers. I saw: “LandFormer offers you a way to try the game for free, and if you like it, buy it.” That customer sees: “Hey, a free game!” And then is angry when they discover they can’t play all the levels for free. In the end, I’m not sure if the pricing model I chose for LandFormer was the right call or not. I’m not convinced that I wouldn’t have made more money by distributing a Lite version and a separate paid version (or only a paid version). App Store customers have gotten used to that model. I think it’s a problem with the fact that IAP didn’t exist from the start. Users had a year to get used to a certain business model, now we’re trying to change that. It’s going to be a difficult transition. Not to go on about this for too long, but I think the Free + IAP model works best for games where you’re giving away a complete game for free, and then selling IAP for additional content that’s not required. If I ever do another free game, I’ll be looking toward that model. Apple launched iOS 4 on June 21, 2010, 8 days before I launched LandFormer, but 2 days after Apple had approved it. I had time with the beta SDK to make sure the game didn’t crash and that the game could be put into the background and restored properly before shipping it. However, I spent a great deal of time over the next 3 updates fixing weird little issues that cropped up because of iOS 4 multitasking. Multitasking caused all kinds of problems with my level sharing system, as well as my save system. I believe there was also one crash that only showed up in iOS 4 because of a change in the way some touch events fired. I’m not blaming Apple, it was just bad luck on my part that I launched so close to iOS 4, and I couldn’t afford to delay the launch of the game any more to deal with all the little issues that cropped up. I mentioned in the introduction that I decided to include ads in the free version of the game. This is in this section for several reasons. At the peak of LandFormer’s popularity, it was being downloaded about 12,000 times per day. This translated into about 50,000 ad impressions a day. However, my click-through rate (CTR) was abysmal. It turned out that the way I was loading ads meant that a lot of people never saw the ads I requested. On my best day, I made about $5 off of ads. In the first update to the game (v1.1) I released a fix that made sure that ads were displayed properly to users. However, by the time it was approved I was down to a few hundred downloads a day of the free game. Even though my CTR increased dramatically with the change, my earnings averaged out around $0.30-0.40/day. On top of that, the ad network I used had a crash bug in its code. After a couple of weeks trying to help them track the problem down, they told me they weren’t going to look into it any further. I was getting several support requests a week from players about this crash, so ultimately I pulled their ad network out of my game and I wrote my own custom system. The game now (in v1.1.2) pulls ads of my own server. This is cool for several reasons. Now I get to decide what ads get shown in the game, it means I can cross promote my other games, and it means that I can promote games that I actually buy and play. I use LinkShare to get a small royalty any time someone actually buys through this system, but that’s been next to nothing so far. Still, I’d rather help support developers whose work I respect and have no crashes, than get the $0.30/day but with 10% of users experiencing a crash every time they launch the game. When I built the IAP system I was very excited to be able to sell themes (skins) for the game. The way I had set up the graphics engine meant that it would be easy for me to load different textures to change the look of the game. I thought players would like the chance to be able to customize their experience a bit more too, but I was wrong. I’m seeing about a 0.1% conversion rate on themes (i.e. about 1 in 1000 people download a theme). At this point, I only have one theme for sale. So it could be that people just don’t like that theme. It could also be that people just like the default art more. Or it could just be that people really don’t care about theming this kind of game. Though, if you think about it another way, if 1 in 100 people buy the premium content, the users who would buy a theme are probably a subset of that 1 in 100. So that means about 1 in 10 of those people have bought the theme, so maybe that’s ok. Still, when you do the math, that’s about $100 made off the theme so far, and it took almost a week of art work to build it (not even counting the time it took to put the theming system in place). When you look at it like that, it’s not as worth it. I’m currently working on another theme. If it doesn’t sell, I probably won’t be releasing more themes. I think themes would sell better in a game where you could play the whole game for free. I think people might be willing to buy a theme in that case. I’ve already outlined why I thought this worked for the project, but doing everything by oneself also comes with some big downsides. The biggest is time. LandFormer took 5 months from start to launch (then another month of work after launch). I’d guess that at least 2 months of that was doing the artwork and UI design for the game. If I could have afforded to pay a professional artist to do that for me, they probably would have taken half the time, and they could have been doing it while I programmed. The other big downside is not having someone to bounce ideas off of. Working with an artist allows you to brainstorm, to try new things, and play with the concepts in the artistic direction of the game. When you’re doing it all yourself, it’s easy to get caught in the trap of just doing the first thing that comes to mind. It’s hard to force yourself to try multiple things and to find the best artistic solution to a problem. In the end, I’m extremely pleased with the way that LandFormer turned out. I think it’s my strongest game to date. The game was also an opportunity for me to experiment with several new things I’d never tried before: IAP, free games, ad-supported games, and user-created content and sharing. I’m very happy with the number of free downloads the game has had. I find it absolutely amazing to think that almost 150,000 people have downloaded my game! At the same time, I’d be lying if I said I was happy with the conversion rate I’ve seen from free to paid. The game continues to get a couple hundred downloads a day, and it seems to have stabilized there. I hope that it will maintain this level (or higher) for quite some time. The fact that it’s free seems to help keep the downloads alive. Every game is an incredible learning experience, and I’ve learned a lot in making and launching LandFormer. I’ll be continuing to support it and add new content, but I’m also looking ahead to what’s next. Onward! It’s been over a month since my last post and I’ve been working hard on LandFormer. I was shooting to submit the game to Apple by the end of May, but seeing as today’s the last day of May and the game’s not ready, that’s not going to happen. I apologize to those of you who are waiting to play the game. The good news is that I’ve had my testers playing the game and I’ve received a tonne of great feedback and bug reports. I’ve decided that a lot of the feedback was worth implementing to make the game easier to learn and nicer to use, so it’s been taking a bit longer than I thought to wrap up. The good news is that I should be ready to declare Alpha (feature complete) by the end of the day! I’m working on the last major feature today, and I should be able to wrap it up by this afternoon. After that it’s all small improvements and bug fixing until I ship the game. So the game is coming along. It’s taken much longer than I originally planned, but I’ve put in a lot of really cool features that I hadn’t originally planned on; things like: in-game level editor, the ability to send levels to your friends, and an in-game store so you can download more levels and game themes. All of these things take time, but the end result is a game that I’m extremely proud of and very excited to get into your hands once it’s ready. With this game I’ve taken an “it’s done when it’s great” kind of approach. I hope it’s worth the wait. If you read the LandFormer preview on Touch Arcade back in March, the article mentioned that I was hoping to release the game in late April. At the time I did the interview that really seemed like a realistic goal. That’s not looking likely anymore. I thought I should post an update since I’d received a lot of questions recently about how the game is coming along and was I still planning to release in April. As often happens, life and some technical challenges got in the way of me finishing the game on time. My gut tells me that I’ve got about 3 weeks of work left on the game at this point. I want to make sure the game is as awesome as possible for when it launches, so I hope you’ll understand that I’m taking this time to make sure the game is the best it can be. Since my last post about the game, I’ve implemented some pretty major changes to the game. One of which was a complete overhaul of the artwork in the game. I liked the theme of the game, but the artwork seemed a bit dark and drab, so I’ve worked to brighten things up and make the game more appealing and enjoyable to play. As you can see, the game is basically the same as it was, but I think it looks a lot better. I hope you agree. One of the other big things I managed to get working was the level editor and level sharing code. When the game ships, it will ship with a bunch of built-in levels. However, it will also contain a level editor so that you create your own levels. Not only that, but you can email levels to your friends so that you can play each others’ levels! This feature was a little more work than I had originally planned for, but I think it adds a lot of fun to the game, so it was worth it. It should allow you to keep playing LandFormer long after you’ve solved all the built-in levels. Several people have asked for more details about how the game is played. I think it’s easiest if I create a short video showing the game in action, but that will have to wait for a few days. Hopefully I can find some time to do that soon. Until then, please know that I’m working as fast as I can to get the game done and into your hands. I’m working hard to make sure it’s the best game it can be.